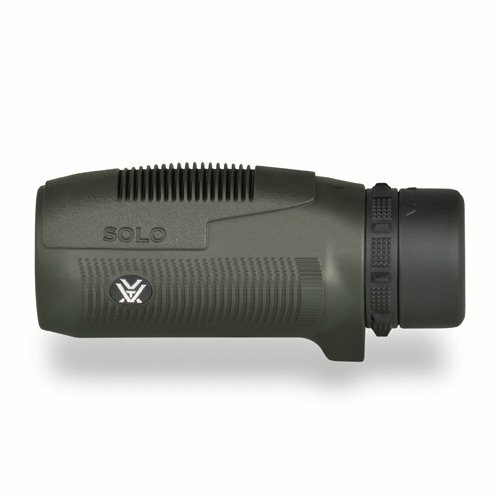 If you’re looking for a monocular that offers fantastic quality at an unbeatable price, look no further than the Vortex Optics Solo. Read our essential guide to what’s on offer. If you enjoy outdoor pursuits and want to get a good look at the world around without being weighed down, a monocular is a great choice. Easy to carry and with the ability to offer excellent magnification, a monocular provides convenience without compromising on quality. 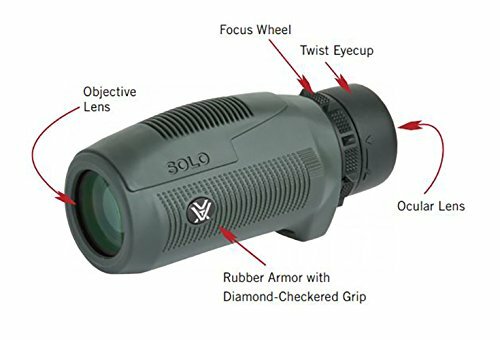 The Vortex Optics Solo Monocular is one of the top-selling models on the market, but does it deserve all the praise it receives? We take a closer look at this optic to see whether it’s as good as it seems. Like most monoculars, the Vortex Solo comes with a pack of accessories which are designed to be used while in the field. More specifically, the Solo is accompanied by a soft cleaning cloth, carrying case and neck strap. The only accessory missing that some users might notice is a lens cap. It is possible to purchase after-market caps but the fit doesn’t tend to be as snug as custom-designed caps. The inclusion of a strap gives you the option of either carrying your monocular in a bag or pocket or wearing around your neck on the lanyard. At between 4.4” and 4.9” depending on the model you select, the Vortex monocular is a compact design that can be carried anywhere with relative comfort. If you choose to use the lanyard, there is a convenient loophole in the monocular that allows the threading and securing of the strap with relative ease. The larger models also come with a tough utility clip for even greater portability while in the field. The clip is extremely durable and can easily be attached to either clothing or equipment. No matter how convenient a monocular is, if it doesn’t offer a decent field of vision, it’s not worth a single dime. Luckily, the Vortex Solo Monocular packs a pretty powerful punch. You’ll get the choice of four separate options when you purchase the Vortex: 8×25, 8×36, 10×25 and 10×36. For those unfamiliar with the monocular jargon, this means a magnification of either x8 or x10 and a lens size of either 25mm or 35mm. The field of vision is excellent across the range, for example, 10×36 offers the ability to view 325 ft at 1000 yards. The eyecup is easy to adjust and moves both up and down with a simple twist. This is a useful option for those wearing glasses as it allows extra room between the lens and the eye. The only slight drawback is that the eye relief is just 15mm, which could present a problem for those wearing glasses. A more comfortable range would have been 19mm which wouldn’t restrict the peripheral field of vision and would also make use easier for all. Recommended Reading: See how this model stacks up against the rest in our guide to the top monoculars. The clarity of the images is something very special with the Vortex Monocular, and would be more than worthy of models two or three times the price. The reason why this is quite so good is due to the coating and technology used to protect the lens. The optics are fully coated using a variety of anti-reflective materials on the air-to-glass surfaces to allow the optimal amount of light through the lens. This ensures the images are as bright as possible, allowing even the small details to be easily viewed. This clarity of vision is preserved by a range of smart design features that really make the difference. The barrel uses nitrogen to resist any fogging and the lens is sealed with O-rings which stops any moisture, water, dust or dirt from entering. All of these features combined mean the images are sharp and clear. The close focus is approximately 16ft for all models, but feedback suggests that the quality of the field of vision isn’t quite as good at close range as it is at distance. However, the excellent images over longer ranges more than makes up for the lack of crispness at closer distances. It is possible to fine-tune the focus of the images by using the wheel situated just behind the eyepiece. This provides maximum control and enhances the sharpness of the visual field. Although monoculars are designed for use outdoors, they also house fragile lens so the composition of the casing is an important part of the package. Although you might want a monocular that looks smart, it also needs to be tough and durable too. The good news is that the Vortex Solo rt is fully rubber armored, making it extremely hard-wearing. This rubber exterior offers excellent grip and is both shockproof and waterproof too. This means that even if you accidentally drop your monocular while out in the field, it should easily withstand the knock without sustaining any damage. Reviews suggest that even if the drop is substantial enough to scratch or scrape the outer, the shock-absorbing qualities are sufficiently robust to prevent any interior damage. From a practical perspective, the grip on the body makes the Vortex Monocular easy to use even in wet and slippery conditions. However, the lightweight plastic means that it won’t feel too heavy around your neck, even when worn for long periods. The total weight is just 9.7oz for the larger models, making it very manageable to carry around. The smaller 25mm monoculars are even lighter, weighing only 5.6oz. 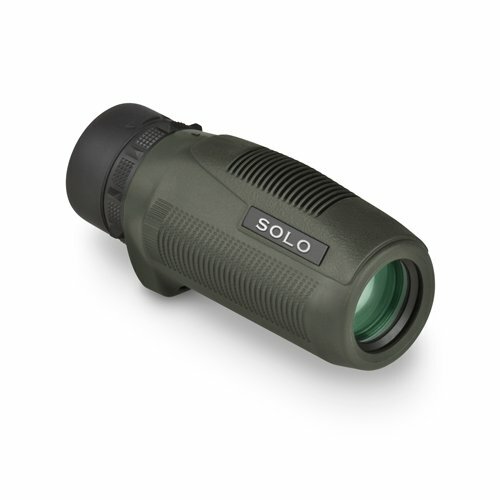 The Vortex Optics Solo Monocular is priced very competitively, at the low-mid point in the market. This makes the image resolution even more impressive and far exceeds what could reasonably be expected for the cost. The technology used to keep the barrel free of fog and moisture mean the same high performance can be enjoyed in all weathers, including rain and snow. 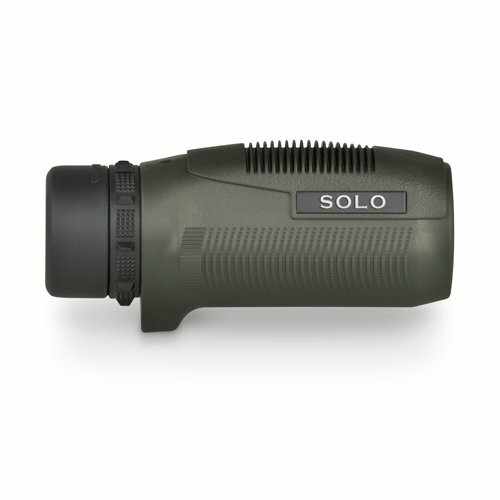 This, combined with the high-grip exterior, make this monocular one that is a real must-have piece of equipment for anyone who enjoys hunting, birdwatching, hiking or any other outdoor pursuits.